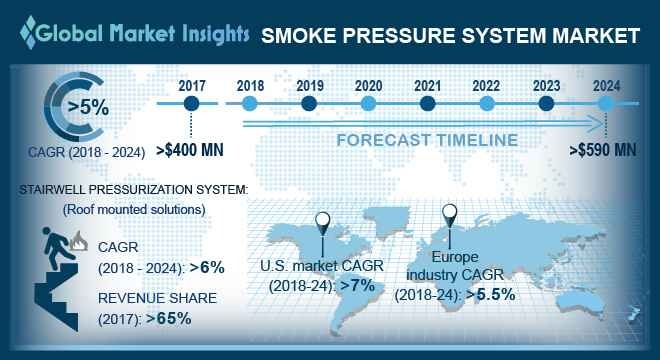 Smoke Pressure System Market size is set to exceed USD 590 million by 2024; according to a new research report by Global Market Insights, Inc. Rising demand for protecting escape routes and fire-fighting shafts against the ingress of smoke in residential and commercial establishments is anticipated to support the smoke pressure system market over the forecast timeline. The systems help in restricting the spreading of smoke to nearby areas by maintaining the pressure within the escape route, which is usually higher than that in the adjacent spaces. Several fire incidents have occurred over the years where occupants have died due to smoke inhalation while attempting to evacuate through the stairwell or elevator lobby areas, which is compelling the increasing installation of these systems in buildings. An increase in the investments made by several government organizations, especially in European countries to construct a sturdy infrastructure and refurbish the existing one with advanced technologies is contributing to the smoke pressure system market growth. Stringent government regulations pertaining to the public safety in tall buildings are expected to encourage the adoption of pressurization systems to ensure the safety of people & property. Increasing number of data centers coupled with the growing construction sector across various regions worldwide is providing significant opportunities to the stairwell pressurization system market growth. Factors such as high maintenance cost coupled with the difficulty in designing & testing of pressurization systems in high-rise infrastructures & skyscrapers are anticipated to limit the stairwell pressurization system market growth. The architectural layout of a building plays a critical role in determining how the exterior stack force on the building is translated to the interior vertical shafts within the building. Small changes to the architectural layout of a building can impact shaft-to-building difference pressures. In stairwell pressurization system market, roof-mounted systems acquired over 65% revenue share in 2017 that can be attributed to the enhanced capabilities of these systems in eliminating the harmful effects created when humidity and high temperature are causing physical efforts and work to be difficult. These establishment are usually made of anti-corrosive galvanized steel metal and have a robust structure that can withstand extreme climate changes. To avoid the entering of cold air, the diverting unit’s roof frame is insulated internally and sealed with an insulated multi-leaf damper. Roof-mounted stairwell pressurization system market are increasingly being used in high-rise buildings as these systems help in facilitating the ease-of-use with the provision of vents on multiple floors, contributing to the industry growth. In smoke pressure system market, the supply air fan units accounted for over USD 200 million in 2017 and is expected to grow significantly over the future. Easy-to-use characteristics followed by the reduced implementation cost of these components are anticipated to contribute to the industry demand. These units can generate airflow both in parallel to the impeller as well as in a radial direction to it, providing static pressure. Supply air fan units can be activated automatically or manually with the help of a fire detection system. Furthermore, the demand for the control panel is expected to gain momentum as it automates the process and enables enhanced control over the entire system. The Europe smoke pressure system market is predicted to grow at over 5.5% CAGR over the forecast timespan. The growth can be attributed to the rising demand for fire suppression & protection technology to minimize potential loss of property & lives under fire conditions. Increased government investments in infrastructural activities coupled with the presence of large industry participants have provided the potential for the growth of the stairwell pressurization system market. The presence of several standards & regulations in Europe is encouraging manufacturers to offer high-quality fire suppression and smoke control systems. In addition, the rise in fire protection expenditure by enterprises and institutions along with technological innovations is contributing to the regional stairwell pressurization system market growth. Key players in the smoke pressure system market comprise Greenheck Fan Corporation, FlaktGroup, Systemair AB, Sodeca SLU, Colt International Ltd., Nuaire, Aldes Aeraulique S.A., Essmann Group, NOVENCO Building & Industry, Strulik GmbH, Air Pressure Solution, and GSBmbh. The smoke pressure system market is consolidated due to the presence of few major companies holding the majority of the market share. The industry participants are investing heavily in the R&D and increasingly focusing on the design and manufacturing of pressurization systems in compliance with the industry standards & regulations.